WPC 56 Series 3 – Who’s in? Both Father Brown and WPC 56 returns for a third series. A Halloween ghost story, a Christmas wedding, the arrival of a new nurse and farewell to some familiar faces, tune into Doctors this autumn on BBC One to find out more. A press release from Endemol Distribution, confirms that there will be just FIVE new episodes for series three, but it also states that they will be one hour long (Series one and two episodes were only 45 minutes long). It’s 1956 and fresh faced WPC Annie Taylor (23) is the one and only female officer in the Brinford Police. Trailblazer WPC Gina Dawson has now moved on to pastures new in the Met, leaving Annie to walk the very same beat, but with a rhythm all of her own. Hailing from a respected police family this way of life is in Annie’s blood, but as the first woman amongst them to join up she has big shoes to fill, not least of all her father’s. Annie is determined to be the best policewoman she can be, and with the same old attitudes to contend with at work and at home, it’ll be an uphill struggle. But Annie Taylor is gutsy and tenacious; she’s never given up on anything in her life, and she’s not about to start now. So who will be returning for series three? Filming on series three commenced on Sunday 19th October 2014 and some of the cast have already announced their involvement. So, with WPC Dawson heading to the Met, we will be seeing a new WPC on the beat in Brinford and she will be played by Claudia Jessie, revealed in this tweet from her agent. At the end of week three filming Liam Jeavons (PC Tommy Perkins) posted a few pictures on his Facebook page and we finally got a look at the new WPC. Initially heavily hinted – James Barricale will return as Sgt John Swift, unless he normally wears 1959 cardigans! So Susie, PC Perkins and Sgt Swift are back, as confirmed by this picture from Liam Jeavons on Twitter, but who else will we see? 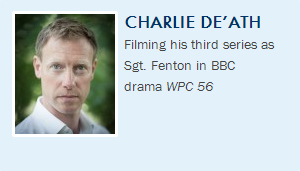 News update from Waring & McKenna confirming Charlie’s involvement in Series Three. Charlie was last seen on our screens as a land agent in the BBC series Our Zoo, and it now seems that he will reprise his character from series one and two after his agents confirmed his involvement on their website. With confirmation that Daniel Brocklebank will reprise the character of Carl Saunders it does seem very likely we’ll see Mark Healey so they can pick up their storyline from series two. Susannah was a series regular in ‘Drop The Dead Donkey’ where she played, the not as cheerful as she sounds, PA Joy Merryweather. Susannah was last seen on the small screen in the 2012 ‘Outnumbered’ Christmas special, where she played Tatiana. Committed to the show until December, joining the cast in the role of Vicky Hall. Joanna has previously appeared in Shameless, Holby City and Doctors. A graduate of Birmingham School of Acting (BSA), fresh from his role as Polly Gray’s lover in the 1920s drama Peaky Blinders, jumps forward 30-odd years in time to play Marty Havers. Amy graduated with a BA (Hons) Acting from ALRA: North (The Academy of Live and Recorded Arts) in 2014 and this is Amy’s first TV role. Amy is a finalist in Monologue Slam at Birmingham Rep on 5th November 2014. Casting Call Pro gave a hint to one series three storyline when they reported that Diane Ellis will play a Beauty Pageant Guest. The cast and crew completed a shoot at Chateau Impney, Droitwich on 30th October 2014. During the first week in November series three scenes were filmed at the Black Country Museum, Dudley and in an old factory unit in Birmingham’s Jewellery Quarter. I got very excited on set today as we were using a drone cam! It flew!! Before you point it out I realise that I’m a total tech film geek.. When I hear any news I’ll update this post, so watch this space. This entry was posted on October 3, 2014, 10:40 pm and is filed under BBC, Birmingham, WPC 56. You can follow any responses to this entry through RSS 2.0. You can leave a response, or trackback from your own site. Ben Turner is currently on tour playing in The Kite Runner until November which would suggest he wont be returning as DI Harper. He did meet up with Liam though when they were playing in Brum, or at least Liam went to his play, so maybe the possibility of a fleeting appearance by him in the show much like Burns at the start of S2. Love reading about this new series. I have a tiny-weeny walk-on in the first episode playing a down the bill vent act. Got to work opposite Brian Capron. Thank you BBC. Saw your scene with Brian Capron on Wednesday Gerry, in a preview screening. Brilliant opening episode can’t wait to see how it all pans out next week. Hi! Thank you for your kind words. I am looking forward to seeing it myself. If I can, I would like to get a still from the scene. Once again…THANKS. Gerry. Can’t help you there I’m afraid as I’m not involved in the show. You could try contacting the BBC Birmingham PR team or the Drama Village direct as they may be able to help. You looked great on the big screen as the ventriloquist Gerry. Looking forward to watching the episode again on Monday. Pleased you enjoyed it. Thanks again. Regards, Gerry.